Now that spring is here, thunderstorms can grow quickly and bring with them tornados and damaging hail. But you don’t have to be blindsided by sudden, dangerous changes in weather. Weather apps on our mobile devices with real-time alerts can keep the family safe and well informed. We recommend the following severe weather apps for their timely alerts, local mapping and other life-saving storm information. This app has a wonderful tornado warning features with its audible siren that automatically goes off when NOAA issues a tornado warning, even if app is closed! This helps reduce the chance of you sleeping through an actual warning. There is also a notification sent when the warning expires – especially important if the power goes out while you or your family is in a safe room. The app also includes simple messaging to let friends/family know you’re safe with customizable “I’m Safe” notification sharable through social media, text and email. An informational section gives you step-by-step instructions to help you know what to do even if the cell towers and TVs are down so you can prioritized actions for before, during and after. You can access this even when you have no cel signal. The Tornado app also allows you to monitor weather for distant family members who might not use a smart phone or are traveling. 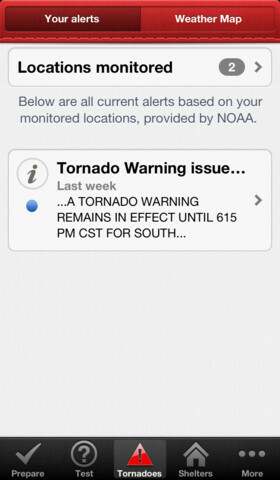 It does this by receiving tornado watch and warning alerts based on their location. This app has a few features that set it apart from the rest. It provides alerts on your smartphone when you enter an area “watch box“ that you specifically set up. This way you only get alerts for severe weather in your exact location, not every alert that hits the county you are in. It also has a “Follow Me” feature that knows where you are located especially if you are driving or shopping away from home. The app will alert you if you enter an area where a watch or warning is issued, without you having to do anything extra. The iMap Weather Radio provides audio alerts in the form of beeps followed by a brief description of the alert type and in certain areas you can view streaming video of severe weather coverage. Similar to the Red Cross Tornado app, this one also has a Friends and Family feature to alert you to dangerous weather that you have saved to additional locations. This means you can make sure friends and family, at school, work or out of state are safe. One small word of warning. Because this app uses location-based services to track your device for precise alerts, the app will consume some battery power. However, the developers have made efforts to conserve battery life by letting you control how much accuracy you want the app to use for your location. We liked this app for its crowdsourcing feature. 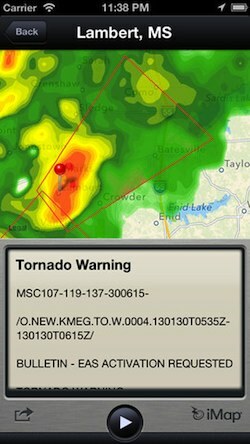 TornadoSpy allows you to report tornados and hail you have sighted as well as view official and user spotted tornadoes locations in your area instantly. To help you evaluate your safety the app has animated radar maps, overlaid maps, colorful warnings and tornado forecast maps, plus radar snapshots of tornado sighting areas. You can set up alerts that are pushed to your phone. There are more tornado apps available from the apps stores, some are very specific to the Tornado Alley states such as Arkansas and are sponsored by local television news stations. If you live in such an area it might be worth looking into these apps because of the precise weather analysis and safety information they can deliver in real-time. Thank you, Susan. This is a very helpful overview of mobile appps that can be helpful if not lifesaving in a weather emergency. They seem well worth looking in to, especially for those of us in tornado-prone areas of the country.